With the goal of Acire and Python Snippets seeking to serve multiple distributions, it seemed appropriate to give it it’s own website. Thanks to the wonderful people over at wordpress.com for making my fave CMS available as a free hosted service, we now have our new website! This was a result of a few hours work, so there is plenty to do on the site. Let me know what kind of content you would like to see. Following these projects for a while and keep asking myself, why isn’t this a web application? Python Snippets could be a pure web app. Acire partially and the rest could be editor plugins that talk to a the web app through some API. 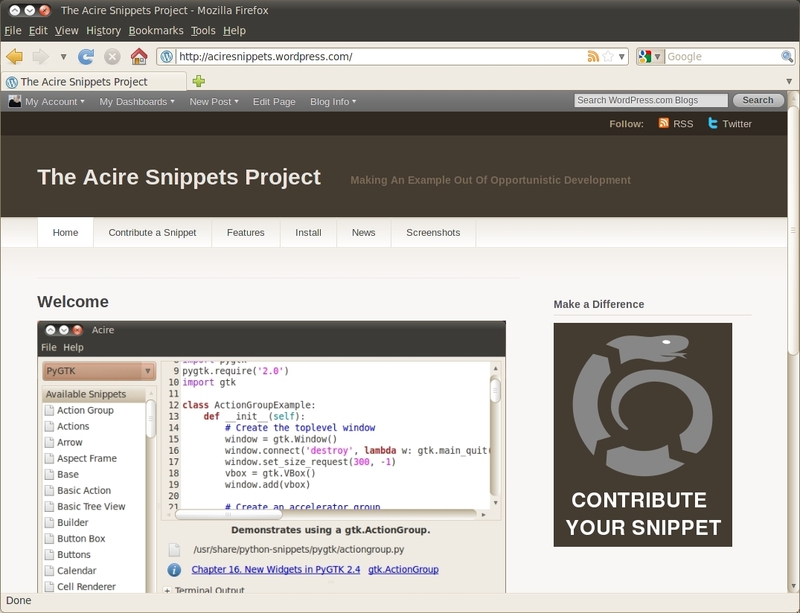 So the project has the snippets in python-snippets and Acire as a desktop frontend. The reason I wrote it this way is to have multiple frontends, and in fact RainCT wrote a simple web frontend. The desktop client has a bunch of benefits though such as the ability to run and test snippets, desktop integration and more. If not a full website at least a website that could be added to and still update the snippets. One that pulls and pushes to the latest python-snippets build (or at least adds suggestions to the queue). Is there any sort of plan to add website functionality? I would donate the server space if needed. I think having a web frontend for adding a snippet would be great: it could then just bzr commit that snippet and propose it automatically so the python-snippets team can review it. Unfortunately there seems to be an error checking out acire from bzr.